Are you still looking for the hair wreath that can create an instant stunning hair style? Vivivalue Hair Wreaths are wise choices indeed due to their creatively designed styles, the economical price. Vivivalue have been sourcing high-quality raw materials for our products since the establishment of our own company and factory. Before buying, you can contact us any time if you have any question. After purchasing, contact us first if there is anything problem with your item. We will do our best to serve you and make you satisfied before you make every feedback. Excellent handmade materials and exquisite workmanship . Each flower is carefully crafted and the leaves are assembled so that they look neatly lied in a bundled fashion. This flower crowns are made out of handmade silk flowers but when one looks at it they look like real flowers with the same soft and velvety texture. This flower crowns aren't just for fairies, princesses, or little girls. 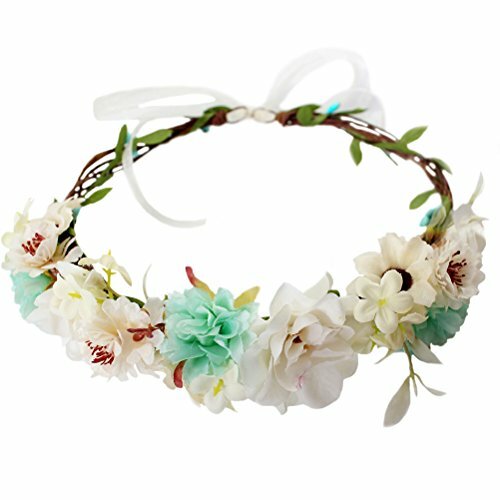 Everyone can wear this flower crown! 1. Please allow 1-5 mm errors due to manual measurement and allow slight color difference due to different computer monitor. 2. A little changeful form is inevitable during handling, storing and transportation. Please pull each petal to recovering its shape after receiving it. Using it for a period of time will make the shape more beautiful. 3. Because it is handmade, normally, one or two pieces of petals will fall off. But it can be easily glued without influencing the overall outlook. 4. Avoid touching water. If you don't use it for a long time, please seal it in plastic bags in cool and dry environment. If you have any questions about this product by Vivivalue, contact us by completing and submitting the form below. If you are looking for a specif part number, please include it with your message.